We're in the midst of a digital media-making revolution--and the Canon ® Vixia ® G10 and XA10 camcorders are at the forefront. Blurring the line between "pro-sumer" and professional, the G10 and XA10 are sharper, cleaner, more compact, more portable, and boast more professional features than any prior palm-sized camcorder in their price range. This book is a comprehensive field guide to the concepts, strategies, equipment, and procedures for achieving the best results possible with Canon's top-of-the-line palm-sized camcorders. 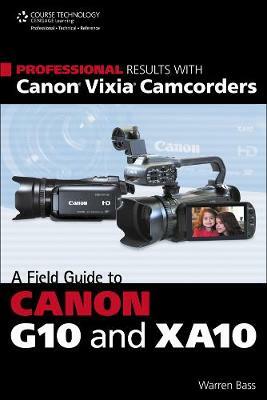 The guide focuses on the specific features of the Canon Vixia HF G10 and XA10, but users of other camcorders in the Vixia series, the Legria series (shooting PAL), and other camcorders will find a wealth of relevant information. With a high-definition palm-sized camcorder such as the Canon Vixia G10 or XA10, your potential is limited only by your imagination and your resourcefulness.